Observation - Large Skipper Ochlodes venata - Global. 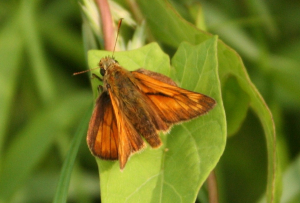 Description: This Skipper butterfly was basking in the afternoon sun with fore-wings partially raised and the hind-wings in a more horizontal plane - apparently the classic poise for Skippers. This Skipper butterfly was basking in the afternoon sun with fore-wings partially raised and the hind-wings in a more horizontal plane - apparently the classic poise for Skippers.